I just buy a new laptop brand and i install clean windows 8.1 install work fine after finish still work fine no problem at all, but when i shutdown the windows. i push a power button on. After that my dell show windows logo and stuck with blank screen after 3 minute appear error screen capture? Someone Please help me, i am stress 2 days fresh install windows 8.1 or windows 10 still appear the same problem? the problem appear when i power button on. and wait 3 minute. error appear screen capture. Is this hardware bug or what?? The reason why I ask is that Driver Power State Failure messages usually indicate a missing or incorrect driver. If you haven't tried it yet, you can go here and run a scan to detect needed drivers. My dell vostro ship with ubuntu os. i was changing uefi to legacy boot will detect dvd rom to install clean windows 8.1. The install was successful without a problem when i click restart button the windows still run perfectly but when i click shutdown the sistem is off. 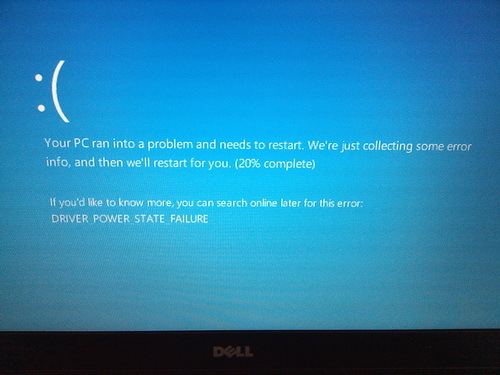 After that, i wait a moment and i push the power button, after 3 minutes cannot display windows and BSOD appear i really confuse the problem occurs when sistem shutdown and i push power button, but when i click restart windows run perfectly without a problem. ?? Can you Help me, cause i really confused. it's bug hardware or software? Since this seemed to have started with installing Windows 8.1 I certainly suggest going over and making sure that all the needed drivers have been installed. I suggest installing the chipset driver first and then the graphics drivers, starting with the Intel HD driver and following with the Nvidia driver and then follow up with the remaining drivers. If you continue to have problems, checking device manager, (press windows key with x key and choose device manager) and see if any errors or problematic devices are listed and that should give you a clue on what drivers are missing.